Seagate has recently announced the release of a new external hard-drive, with an unprecedented storage capacity of 3,000 gigabytes. The new product, named FreeAgent GoFlex Desk, offers portability for users’ files and multimedia content as well as a formidable backup solution. The ever-growing size of multimedia content encourages manufactures to create larger storage devices; Blu-ray movies, high-definition video and audio, and even software take more disk space than ever. Now, Seagate has launched its GoFlex series, which includes a 3-terabyte (approximately 3,000 gigabytes) hard-drive. Such capacity could hold more than 120 HD movies. The new product was designed to provide its users maximal portability, understanding that the laptop market changed consumer behavior and expectations. The 3.5-inch external drive weighs 1080 grams, and its dimensions are 158mm x 124mm x 44mm (height / width / length). Although in comparison to most backup products available its kilogram weight makes it a hefty accessory, but the extra disk space should be an acceptable compensation. The FreeAgent GoFlex Desk can connect to either PC or Mac, using FireWire and USB alike. The latter can utilize the new 3.0 standard, which is promised to deliver super-fast data transfer. Another interesting feature is automatic backup, performed by the supplied software. Windows users can even enjoy 192-bit encryption, securing their data from prying eyes. Rajesh Khurana, country manager of India at Seagate Technology, said: "Consumer capacity demands are quickly out-pacing the needs of business as people continue to collect high-definition videos, photos and music. Seagate has a tradition of designing products that break into new storage frontiers to meet customer requirements and the 3TB GoFlex Desk external drive is no exception, delivering the highest-capacity storage solution available today." Currently the FreeAgent GoFlex Desk is sold only in the US, for the retail price of $250. 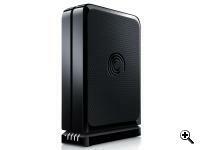 Similarly to most external hard-drives available, the provided warranty is valid for two years. TFOT has covered other Seagate products, such as the Seagate Replica, an easy-to-use back solution, and the Barracuda XT, the world’s first 2-terabytes hard-drive with full support for third generation SATA interface. Another related TFOT story involves an historic landmark in field of storage: the World’s First 2-Terabytes Hard-drive, announced by Western Digital on January 2009. For more information about Seagate’s FreeAgent GoFlex Desk, see the company’s press release.